A perovskite solar module the size of an A4 sheet of paper, which is nearly six times bigger than 10×10 cm2 modules of that type reported before, has been developed by Swansea University researchers, by using simple and low-cost printing techniques. The breakthrough shows that the technology works at a larger scale, not just in the lab, which is crucial for encouraging industry to take it up. Each of the many individual cells forming the module is made of perovskite, a material of increasing interest to solar researchers as it can be made more easily and cheaply than silicon, the most commonly-used material for solar cells. Perovskite solar cells have also proved to be highly efficient, with scores for power conversion efficiency (PCE) – the amount of light striking a cell that it converts into electricity – as high as 22% on small lab samples. The team work for the SPECIFIC Innovation and Knowledge Centre led by Swansea University. They used an existing type of cell, a Carbon Perovskite Solar Cell (C-PSC), made of different layers – titania, zirconia and carbon on top – which are all printable. Though their efficiency is lower than other perovskite cell types, C-PSCs do not degrade as quickly, having already proved over 1 year's stable operation under illumination. The Swansea team's breakthrough comes from the optimisation of the printing process on glass substrates as large as an A4 sheet of paper. They ensured the patterned layers were perfectly aligned through a method called registration, well-known in the printing industry. The entire fabrication process was carried out in air, at ambient conditions, without requiring the costly high-vacuum processes which are needed for silicon manufacture. – up to 6.3% power conversion efficiency (PCE) when assessed against the "1 sun" standard, i.e. full simulated sunlight. This is world-leading for a C-PSC device of this size. – 18% PCE at 1000 lux, equating to light levels in an average supermarket. The high efficiency ratings under indoor lighting conditions demonstrate that this technology has potential not only for energy generation outdoors but also for powering small electronic devices – such as smartphones and sensors – indoors. 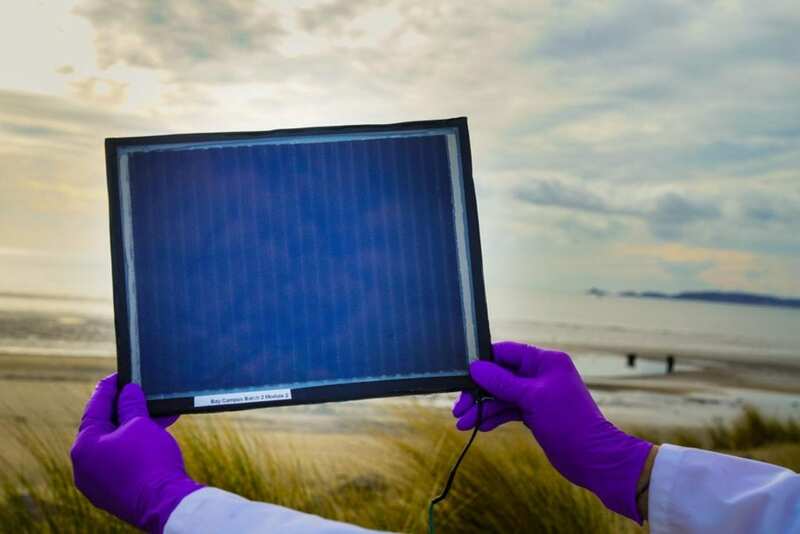 "Our work shows that perovskite solar cells can deliver good performance even when produced on a larger scale than reported so far within the scientific community. This is vital in making it economical and appealing for industry to manufacture them. The key to our success was the screen printing process. We optimised this to avoid defects caused by printing such large areas. Accurate registration of layers and patterning the blocking layer helped improve connections between cells, boosting overall performance. There is more work still to do, for example on increasing the active area – the percentage of the substrate surface that is actually used for producing power. We are already working on it. But this is an important breakthrough by our team, which can help pave the way for the next generation of solar cells"
The research was published in Advanced Materials Technologies and undertaken by researchers at SPECIFIC Innovation and Knowledge Centre, which is funded by the Engineering and Physical Sciences Research Council, Innovate UK and the European Regional Development Fund through the Welsh Government. Authors: Francesca De Rossi, Jenny A Baker, David Beynon, Katherine E A Hooper, Simone M P Meroni, Daniel Williams, Zhengfei Wei, Amrita Yasin, Cecile Charbonneau, Eifion H Jewell and Trystan M Watson; College of Engineering, Swansea University. Funding for the research was provided by the Engineering and Physical Sciences Research Council, the SPECIFIC project, and the Welsh Government. Swansea University is a world-class, research-led, dual campus university offering a first class student experience and has one of the best employability rates of graduates in the UK. The University has the highest possible rating for teaching – the Gold rating in the Teaching Excellence Framework (TEF) in 2018 and was commended for its high proportions of students achieving consistently outstanding outcomes. Swansea climbed 14 places to 31st in the Guardian University Guide 2019, making us Wales' top ranked university, with one of the best success rates of graduates gaining employment in the UK and the same overall satisfaction level as the Number 1 ranked university. The 2014 Research Excellence Framework (REF) 2014 results saw Swansea make the 'biggest leap among research-intensive institutions' in the UK (Times Higher Education, December 2014) and achieved its ambition to be a top 30 research University, soaring up the league table to 26th in the UK. The University was established in 1920 and was the first campus university in the UK. It currently offers around 350 undergraduate courses and 350 postgraduate courses to circa 20,000 undergraduate and postgraduate students. The University has ambitious expansion plans as it moves towards its centenary in 2020 and aims to continue to extend its global reach and realise its domestic and international potential.